My favorite part of Spring – besides the warmer weather – is when the first flowers of Spring bloom in my garden. I always remember visiting my grandmother’s house every Friday as a kid. I would always get so excited the first Friday that we would visit when her tulips and daffodils started blooming. This winter, my grandmother passed away, but the hyacinth bulbs she shared with me last Spring have already started sprouting through the tanbark in my flower bed, despite the snow that fell this morning! This year I plan to add to my garden with tulips and daffodils, just like my grandma. 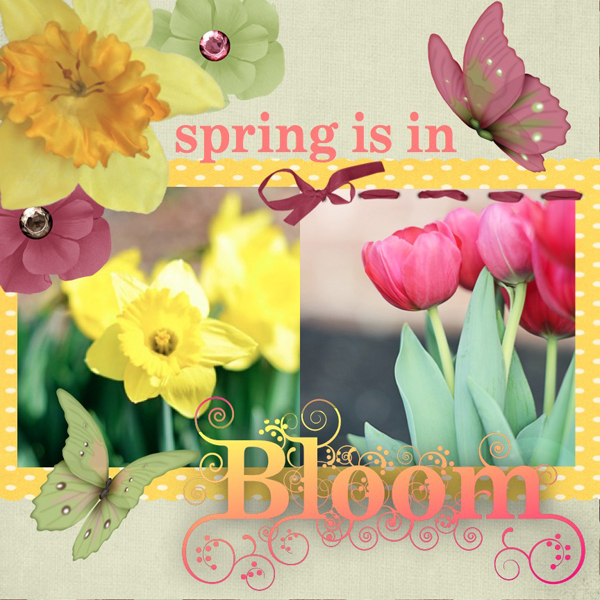 This entry was posted in Design Team, digital, Inspirational Ideas, scrapbook page and tagged daffodils, Design Team, designers, digital, Duetica Lettering Arts Studio, Fonts, scrapbook, Scrapbookers, scrapbooking, Spring, tulips. Bookmark the permalink.